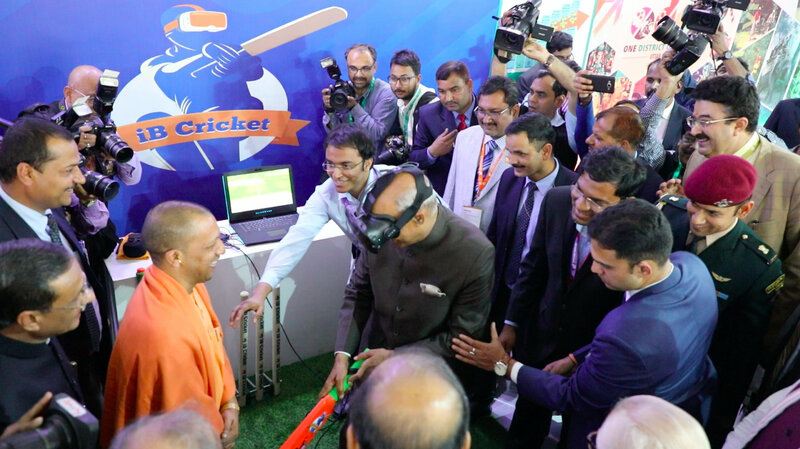 iB Cricket , a revolutionary Virtual Reality Cricket Sport (vSport), developed by ProYuga Advanced Technologies was launched in the presence of the Hon’ble President of India Shri Ram Nath Kovind. He played the first ball of iB Cricket, which is going to be released worldwide in April 2018. It was all smiles when President of India plays the first ball of iB Cricket. “Wow, yeh toh badiya hai, kaunsa stadium hai yeh?”, says President Shri. Ram Nath Kovind expressing his amusement after playing iB Cricket. Shri Yogi Adityanath Chief Minister of Uttar Pradesh was also present during the launch. 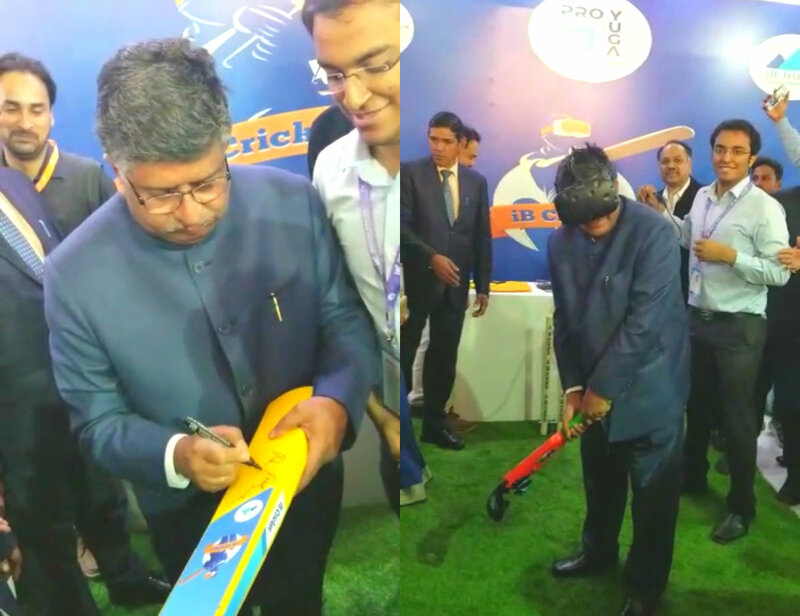 The custom made electronic bat used in the game was also unveiled in the presence of Union Minister Shri Ravi Shankar Prasad, Electronics and IT minister of India who appreciated the team for their exemplary work. This unique format of cricket has gained everyone’s attention at the UP Investors’ Summit 2018 on Thursday. Prominent dignitaries such as Shri Arun Jaitley, Finance Minister, Shri Yogi Adityanath, CM of Uttar Pradesh and others also witnessed iB Cricket. With a vibrant team of IIT, IIM and ISB Graduates, ProYuga is set out to make India a world leader in Advanced Technologies. The founder of Proyuga, Vasanth is an alumnus of IIIT Hyderabad and Trivikram, CEO of the company, is an alumnus of IIT Delhi. Notably, Trivikram has previously turned down a job offer of more than INR 1 crore by a reputed MNC prior to co-founding ProYuga. “The landscape of eSports and VR is experiencing a transformation. ProYuga is at the forefront of this change and ahead of the global market. It is overwhelming to witness the unparalleled commitment shown by UP Govt & iB Hubs towards nurturing a robust and vibrant startup ecosystem”, says Mr. Trivikram Reddy, CEO ProYuga Advanced Technologies. IBC is considered the most immersive VR Cricket experience according to people who have experienced it across the world. It aims to benefit over one lakh members by opening 25,000 franchises across India. iB Cricket is gearing up for its worldwide release in April 2018. “We plan to have a simultaneous launch of the product in 25 different countries. We are highly positive about its potential and are sure that it will be played and enjoyed by a large audience globally” Trivikram added. ProYuga is being supported end-to-end by iB Hubs, a PAN India Startup Hub which was launched in November 2016 by Shri Amitabh Kant, CEO of NITI Aayog.